We’ve done our fair share of overseas travel over the years … everything from four-day business trips to the US to six weeks at a stretch in Europe and Asia as tourists. Like most of us, we’ve struggled with what to pack and what to leave at home. It would be fair to say that we’ve learned a few lessons the hard way over the years so let us offer a few words of wisdom that should help you with your packing. Selecting the right bags can be just as important as what you pack. But that deserves an article of its own so we’ll leave that for another Blog post. However, the one thing you must be aware of is the airline’s checked and carry-on baggage weight and dimensions limits. Remember that you may be flying on domestic airlines on some legs of your journey and they may be far less generous with their baggage allowance. A quick check with your airline(s) beforehand will save a load of stress at check-in and hefty excess baggage fees. TIP You’ll almost certainly be tempted to purchase a few items overseas so savvy travellers carry a small ‘luggage scale’ with them to check the weight of their bags for internal flights and the return journey. These can be purchased for around $40 from most outdoor and camping stores. Make a packing list and do this well ahead of time. This will give you the opportunity to revisit your list and add or purchase essential items and delete those you decide to go without. Click here to download a comprehensive checklist that we’ve prepared for you and we’ve left space for you to add your own personal items. Lay out everything you think you need to take at least several days before your departure. It should then be obvious whether you’re taking too much. If in doubt, try a quick packing trial. Don’t be tempted to pack those ‘just in case’ items that you probably won’t need. TIP If you intend to purchase some new clothes or shoes while overseas, pack and wear old items you’re willing to part with and then progressively dispose of them during your stay to make room for the new purchases and save weight and space for your return journey. It should be a no-brainer to pack clothes suitable for the climate at your destination. In some regions, days may be very warm or hot but nights close to freezing. Good quality waterproof down jackets are relatively light and can be compressed into a small size for packing. You should also be mindful that the dress code at your destination may be less casual than at home. In some countries, particularly in the Middle East, men must wear long trousers and long-sleeved buttoned shirts. Women may be legally required to cover their heads and shoulders and wear loose fitting clothing that covers the arms and legs. You can find some good advice on the ‘Smartraveller’ website about the dress code in the Middle East and other regions. Pack mix-and-match clothes that you can wear with everything else in your luggage. Easy care drip-dry fabrics are best if you plan to do at least some of your own washing in the bathroom sink. Hang them overnight in your bathroom and use the hotel hairdryer to smooth out any creases. You’re more likely to change tops more frequently than bottoms so packing three tops for every bottom is a good general rule. Instinctively, most travellers lay their clothes folded in their suitcase but seasoned travellers swear that rolling will save space and minimise creasing. To save even more space, try placing the rolls into vacuum bags, squeeze out the air and then seal the bags. Alternatively, you can stay organised by placing similar clothing items into separate ‘packing cubes’ (also called packing cells). These can be purchased locally from stores such as Kathmandu but you’ll find them at a much lower price from online stores like Amazon. TIP Before packing your clothes, turn them inside out. This will help stop any lint or stains transferring between garments. Shoes and boots are always awkward to pack. Place rolled-up socks and other small items inside the shoes to save space. Shoes are also a great place to protect small, fragile items from damage. Use cheap, disposable shower caps (or save them from your hotel bathroom) to cover the soles to prevent them soiling your other clothing. Rarely do you need more than two pairs of shoes. Pack only your dress shoes for those formal nights out and wear a comfortable pair on your flight and for sightseeing. If you’re not expecting to be hounded by the paparazzi, leave the stilettos at home. And this is not the time to ‘break in’ new shoes; stick to the comfy shoes you already have and that are sturdy enough for some serious pavement pounding. TIP Pack the heaviest items closest to the wheels (if your bag has them) in your check-in luggage. This places the centre of gravity close to the ground when you’re wheeling your bag making it more stable and manageable. Pack a few essential toiletries in your carry-on and the rest in your checked luggage. See our downloadable checklist here for the toiletry items you’ll most likely need. See through zip-lock bags are handy for keeping all your charging cables and other small items sorted and easily accessible and a laundry bag is essential to keep your dirty clothes separate. We also take a pegless clothes line to hang washing in the hotel bathroom and some laundry detergent. If you must pack a few gifts for your hosts, make them small and light. We’ve found that small lapel badges with the Ozzy flag or a few miniature Koalas are usually adequate. Don’t make the mistake we once made by packing heavy hard-cover picture books as gifts for our hosts. TIP Can’t do without your favourite comfort food? We take along Vegemite in either single-serve sachets or in a tube for our breakfast toast. 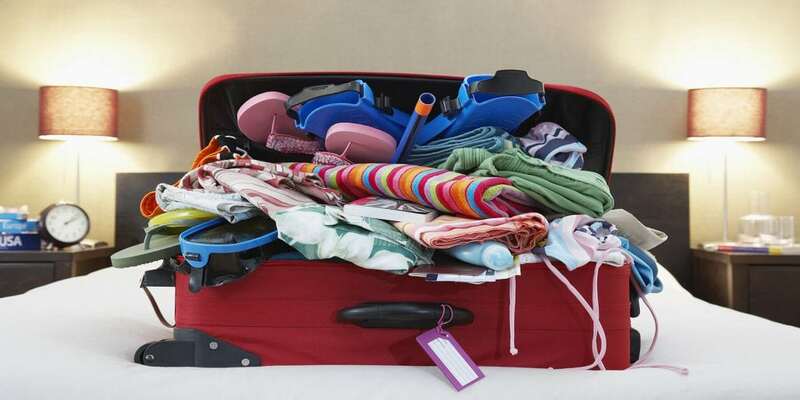 Once you have your clothes, shoes, medication and other essentials squared away, you can add those extra items that you will need specifically for the type of vacation you have planned. You’ll need those hiking boots and other gear if you’re planning on hitting the trail. And what about street and road maps if you’re planning a road trip. Sure, you’ll have GPS on your phone and tablet but we’ve found the good old-fashioned paper maps are indispensable for planning and keeping a record of where you’ve been. On the other hand, guide books can be downloaded from publishers like Lonely Planet and stored on your tablet or you can photocopy just the pages you need from the hardcopy edition. TIP We take along an additional soft, light cargo-style bag of about a 50 litre capacity in our carry-on luggage. This won’t consume much space but will be easier to manage for those short side trips you may take away from your main accommodation. Hotels are usually happy to store your main luggage until you return. You can also use this to bring home those items you never really intended to purchase but just couldn’t resist. We’ve found that a 20 or 30 litre capacity day pack with multiple pockets works best. They’re light, flexible and can be very handy when sightseeing. You can also wear the day pack when you’re in transit leaving your hands free to manage your suitcase. You can find carry-on bag allowance details for Qantas flights here. Check-in luggage can get lost in transit so it’s essential that your carry-on bag has your passport, travel documents, important valuables and any medication plus a change of clothes suitable for your destination. Pack items that will keep you comfortable and entertained during the flight. An eye mask, earplugs or noise cancelling headphones and a neck pillow will help you get some rest. Back-up entertainment on your tablet or an eBook will help with the boredom. Include hand sanitising wipes and lip balm in your toiletry bag. Unless you’re a keen amateur or professional photographer, you might consider leaving your bulky DSLR at home. The picture quality on your smartphone is likely to be adequate in most situations. If you must take a camera, stow it safely in your carry-on. Depending on our destination, we also carry a small torch and first-aid kit in our day-pack when out sightseeing. Make sure you’re familiar with the security restriction for carrying powders, liquids, aerosols and gels on board the aircraft in your carry-on bag. You can find details on the Department of Home Affairs website here. TIP Pack photocopies of your passport and travel and insurance documents in your check-in luggage. Pickpockets and bag thieves are often active at tourist hotspots so it’s reassuring to know that you have backup copies in your main luggage at your hotel. The night before or the morning you leave, go over your checklist again to be sure you’ve packed all those last-minute items like your toothbush, toiletries, medication, sunglasses electronic devices and, of course, your passport and travel documents. Happy travels and we hope you found this article helpful. Download your free packing checklist here.